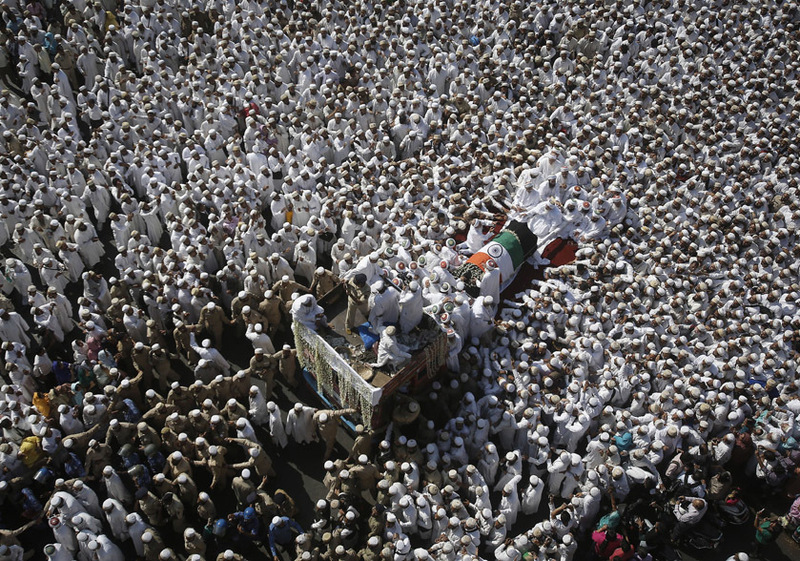 JNN 19 Jan 2014 Bombay : A STAMPEDE killed at least 18 people in India’s financial hub Mumbai on Saturday when a large crowd gathered to pay their last respects to The spiritual leader of Muslim Shia sect Dawoodi Bohra, Syedna Mohammed Burhanuddin, passed away Friday, at the age of 102. His body was kept at Saifee Mahal in Mumbai for mourners to pay their last respects.police said. More than 40 people were injured in the chaos that erupted shortly after midnight local time (1830 GMT) when the gates were shut to the residence of Syedna Mohammed Burhanuddin, who died on Friday. “Organisers had closed the gates. The crowd was so huge that people started suffocating, some fainted and then people began running and falling on each other in a panic,” Mumbai police chief Satyapal Singh told reporters. In reply to a question, Singh confirmed that 18 people died and admitted there was a lapse in crowd control as police and organisers had failed to anticipate the huge turnout of devotees. Mr Singh added that he had ordered a thorough investigation into what led to the pre-dawn disorder. Burhanuddin, who was due to celebrate his 103rd birthday in a few weeks, died of a heart attack at his home, a spokesman said. He was a leader of the Dawoodi Bohra community, a sect of Shiite Islam. Stampedes at public events in India are common as large numbers of people pack into congested areas. Panic can spread quickly and, with few safety regulations in place, the result is often lethal. Home Minister Sushilkumar Shinde told reporters: “I feel very sorry about the tragic incident”, and expressed his condolences for the 18 deaths. Thousands adorned in white scarves and skullcaps had gathered Saturday on the streets of Mumbai for the funeral procession of Burhanuddin, TV footage showed. Narendra Modi, leader of the opposition Bharatiya Janata Party who has been vilified for deadly anti-Muslim riots in his Gujarat state in 2002, called the incident “unfortunate” on Twitter. The spiritual leader, succeeded by his 70-year-old son Syedna Mufaddal Saifuddin, led the Dawoodi Bohra community for nearly five decades. Burhanuddin had succeeded his father Syedna Taher Saifuddin in 1965. He was honoured with civilian titles such as the Star of Jordan and Order of the Nile by the governments of Jordan and Egypt. The latest disaster comes just months after some 115 devotees were crushed to death or drowned on a bridge near a Hindu temple in October, when crowds panicked after rumours that the bridge was going to collapse in the central state of Madhya Pradesh. In 2006, another stampede outside the same temple killed 50 people as they crossed a river, prompting authorities to build the bridge. This entry was posted in Asia Pacific and tagged Bohra, Burhanuddin, Community, Dawoodi Bohra, funeral, Narendra Modi, Shia Sect, Stampede, Syedna Burhanuddin, Syedna Mohammed Burhanuddin. Bookmark the permalink.